Teddy bears are the classic gift that can brighten the day of anyone regardless of age. Crochet teddy bears are a unique variation. Instead of buying any old store-bought bear, why not use those crochet skills to crochet a customized teddy bear stitched by you? 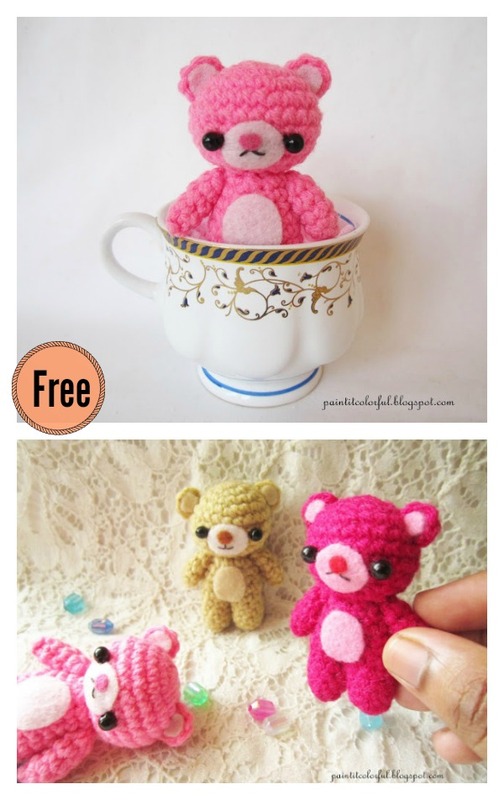 This Amigurumi Mini Teddy Bear Free Crochet Pattern makes a tiny little crochet teddy bear that works up quickly and can go with you everywhere. The tiny button nose and the glint in its eyes are sure to take your heart away. This teddy is so cute it guarantees to bring a smile to every small child. You could turn it into a keychain, desktop decor or a baby toy. You could crochet it in a multitude of colors depending on who the recipient would be. Thanks A little love everyday for sharing this free pattern. The link for the free pattern is provided below photo. Happy crocheting. You might also like Adorable Panda Bear Amigurumi FREE Crochet Pattern.